I’ve been on a grilled cheese kick lately. 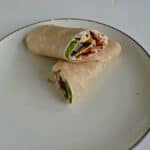 They are super easy to make for lunch or dinner and you can customize them in so many different ways. 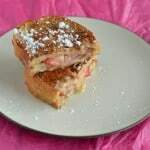 Just check out my Jalapeno Popper Grilled Cheese, Strawberry French Toast Grilled Cheese, and my Apple Gouda Grilled Cheese All three are very different but delicious in their own way. 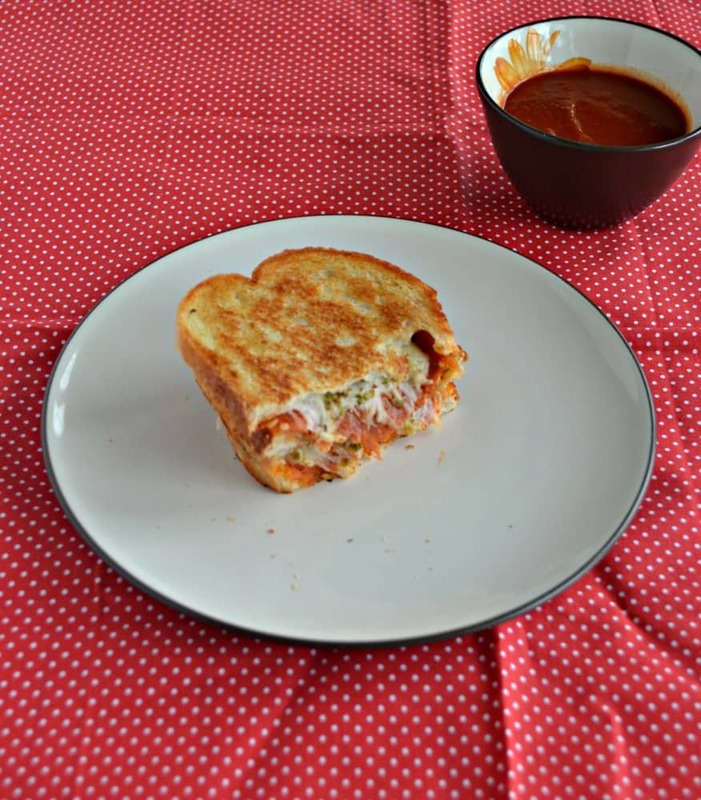 Today I’m sharing a grilled cheese sandwich I’ve made since I was a kid. Back then we had one of those sandwich maker machines that cooked the sandwiches with the push of a button and they came out cut in half. Does anyone remember those? It was like a waffle maker but for sandwiches. Anyhow, once we were in junior high and high school my brother and I stayed home by ourselves on days when teachers worked. That meant we had to make our own lunches and back then we made whatever was easiest. That’s when the pizza grilled cheese came about. It was so easy to put bread, marinara, cheese, and pepperoni in the sandwich machine and in under 5 minutes my brother and I each had a sandwich. 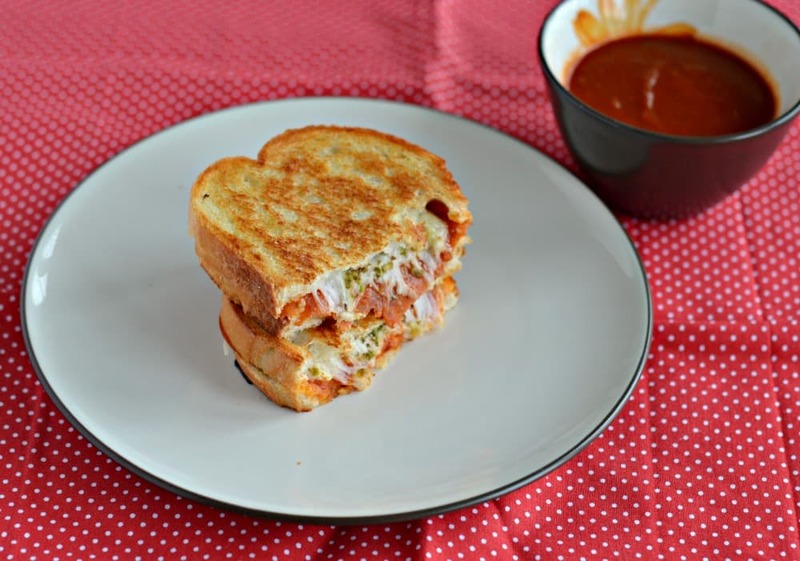 So going back to those days I am sharing my Pizza Grilled Cheese Sandwiches. The only major difference is that now I put some spices in my sandwich. Everything else is still the same. I also like to serve a cup of marinara sauce on the side for dipping! 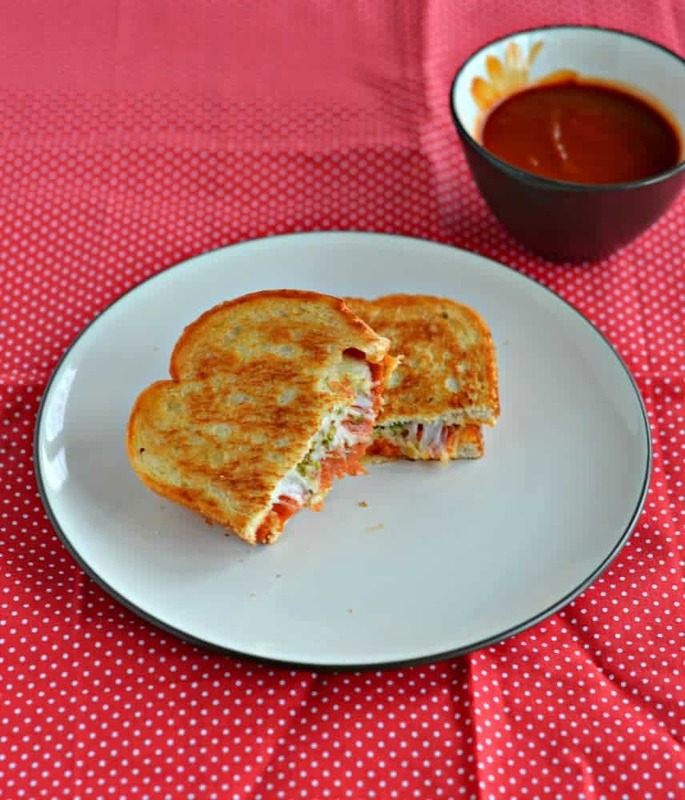 These pizza grilled cheese sandwiches are awesome for both kids and adults. The cheese is so gooey while the spices add some flavor. I love dunking my sandwich into the marinara sauce. 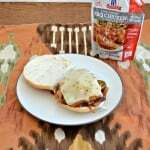 Make sure you try these the next time you need a quick and easy meal! Place a skillet over medium high heat. Butter all 4 slices of bread. 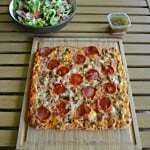 Place two slices in the pan. 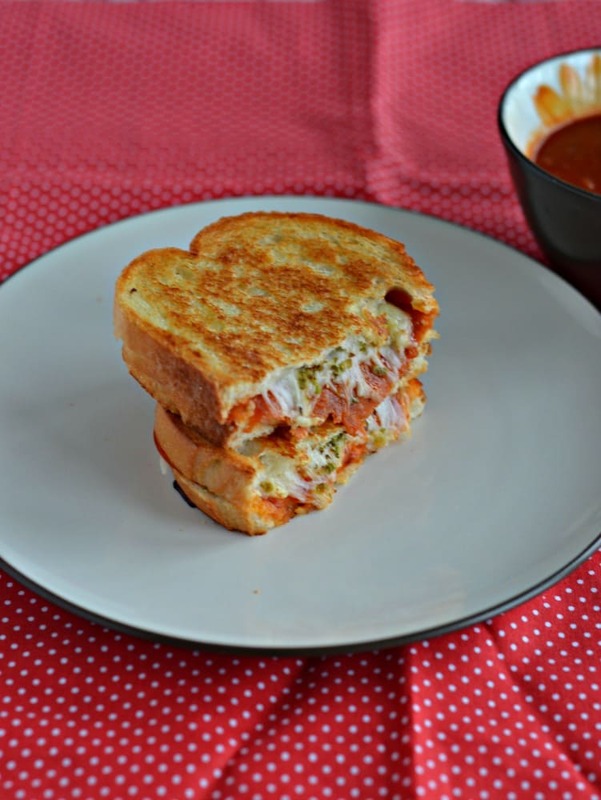 Top each slice of bread with 2 or 3 tablespoons of mozzarella cheese, a sprinkle of oregano and garlic powder, 1 tablespoon of marinara sauce, then 8 slices of pepperoni. After the pepperoni divide the remaining cheese between the two sandwiches and sprinkle with the remaining oregano and garlic powder. Top with remaining slices of bread. Allow the sandwich to cook for about 3 minutes then carefully flip over. Cook on the other side for 2-3 minutes or until cheese is melted and bread is browned. Remove from pan, slice in half, and serve with additional marinara sauce for dipping.